Clint Barton was an orphaned child who ran off with the circus. Over his many years with the Carson Carnival of Travelling Wonders he developed into a superior athlete & martial artist, master swordsman & archer. 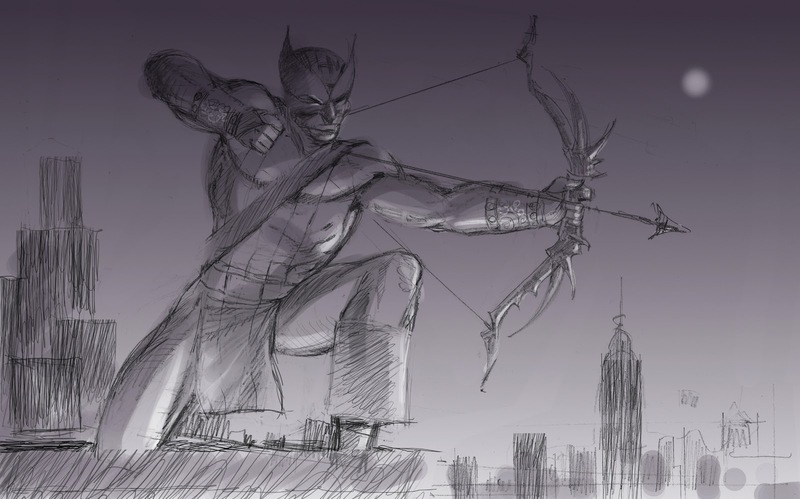 Inspired by Ironman, Barton became Hawkeye, a masked 'superhero', even though he possessed no real powers. Like Spiderman, he was initially believed to be a villain. Finally, assisted by Ironman, he joined the Avengers. 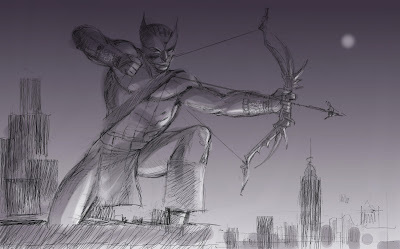 Hawkeye was created by Stan Lee and artist, Don Heck. He first appeared in Tales of Suspense in September, 1964. This is impressive. I'd almost go so far to say that it has a kind of 'majesty'. I'm not familiar with a lot of this 'superhero' stuff, but I really like this tributary that you are exploring in some of your illustrations. It has a really strong and purposeful feel to it, and not just because of the subject matter. I'd love to see more of this kind of definitiveness in your style, in some of your work. Very nice!